Equine Canada announces the loss of 2011 Dressage Canada Long Listed horse and declared 2011 Pan American Games mount for Tom Dvorak, Key West, an 11-year-old bay Trakehner gelding. Equine Canada extends its deepest condolences to Key West's owners, riders, friends and fans. Please find below a statement released on May 13, 2011, by owner Claudia Demandt, rider Tom Dvorak and former rider Amy Jager. 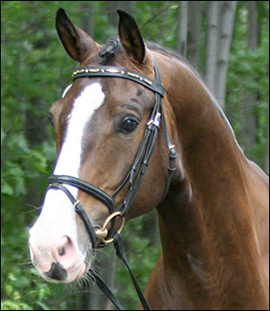 Last week the Trakehner breed lost one of its bright and shiny stars. Key West, who was purchased in Neumunster as a three-year-old by the Jager and Demandt families, was euthanized at the University of Guelph after developing a painful and untreatable compression of the spinal cord. Key West, with Tom Dvorak in the saddle, just returned from a tremendous show season in Wellington, Florida. Together, in the CDI 3*, they cleaned up, winning the Prix St. Georges test with over 50 other entries. Next were the Canadian trials for the Pan Am Games. In 2010 Key West was part of the Canadian Young Rider Silver Medal Team with Amy Jager. Not only was he a fantastic athlete but also a kind soul who captured the hearts of all who knew him. Key West was very much loved by his trainers, owners, grooms and vets. Godspeed Key, you are missed.